As a dedicated cyclist living in Minnesota, I’ve grown accustomed to doing plenty of indoor training over the long winter. In an attempt to keep this wearisome routine fresh and fun, I’ve owned fluid, magnetic, fan and roller stationary bike trainers. 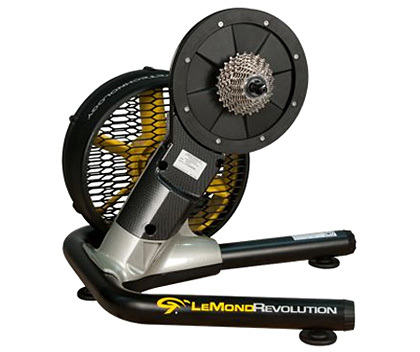 So far nothing has come close to being as fun as riding on the road, but the new Revolution trainer from LeMond Fitness is the closest I’ve found so far. 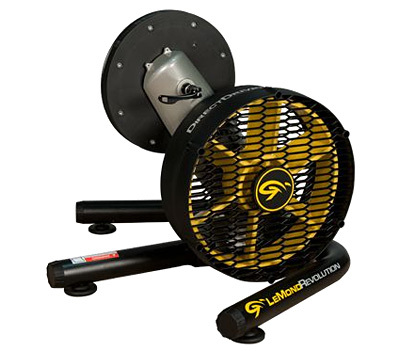 The $499 flywheel/fan trainer is, frankly, awesome! My favorite part about it isn’t the way it uses the flywheel inertia to mimic momentum on the road, but rather the fact that I can mount all of my bikes to it. It is surely the most versatile trainer on the market. Instead of using friction from your rear wheel to engage the trainer, your frame — sans rear wheel — mounts right to the trainer and uses a built-in cassette that’s attached to the Revolution’s flywheel. So, no more trainer specific, slipping, or oddly-worn tires! Since the wheel and tire are taken out of the equation, you can mount differing styles of bikes with no modifications needed. Mounting any bike is as easy as attaching your rear wheel. Gear Junkie founder Stephen Regenold even borrowed the trainer to mount his full suspension rig to train for this year’s Wenger Patagonian Expedition Race (here’s a video with Regenold on the LeMond). With less moving parts than a normal setup, Regenold said he felt safer using it in a house with children and pets moving nearby. Yes, I’m a big fan of this new trainer. But to be fair, I have to point out a few cons: The Revolution trainer is LOUD! Riding hard on the Revolution sounds like you are being chased by a bus. Watching a movie or listening to music while you ride is tough with this trainer. At a portly 32lbs, the Revolution is unwieldy to move. It won’t fold easily for storage or transporting like a lot of trainers can — it’s best left setup and ready to use. Some will balk at the $499 price tag, which could buy most of us a decent set of wheels. However, the versatility and lack of special equipment that’s required on other trainer setups, like wheel blocks and worn-out tires, should be considered in the price. Lemond offers the Revolution sans-cassette for $499 or with a Shimano or SRAM cassette in either nine- or 10-speed for $550. A Campagnolo adapter is available as well. Note: Since the rear wheel is excluded, using training devices like Powertap is not an option, but Lemond does offer a wireless Pilot Power Monitor for $350, which measures watts, speed, distance and more. Overall, the LeMond Revolution has been a solid partner in training this winter. It is a stable, versatile and fairly realistic trainer that has made the long wait for dry pavement and warm breezes just a little bit easier this year.